The 10 Days of the title refers to Elizabeth Cochran Seaman, who, using the pen name, Nellie Bly spent ten days in a New York mental institution, Blackwell Island, in the late 19th century. As a courageous investigative reporter, working for Pulitzer's New York World, her subsequent book, Ten Days in A Mad House, caused a sensation and drove reform of the treatment provided to the women committed to that institution. 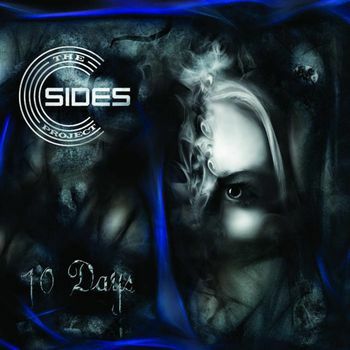 Such is a bedrock on which this third album from Welsh band, the C-Sides Project is built. The C-Sides Project features ex Magenta guitarist Martin Rosser and drummer Allen Mason-Jones and this release marks something of a rebrand, a change of name from the original, plain C-Sides which sounded a bit too like an 80s mod outfit for my liking and new directions provided by Sian Elson on vocals and keyboards from Kevin Dawson. The band themselves declare that this line up and new project represents a step in the right direction, signalling a break from their previous efforts into something more mature. The piece itself starts off in consciously dramatic fashion, the dramatized voice of Bly speaking directly to the listener explaining her mission, doubts and determination, her decisive 'I did' triggering a sonic fanfare and a powerful duet between Allen McCarthy and Sian Elson. The interplay between the two voices works really well and suits the varying textures of the band, a highlight of the second track, Before I Fall which explores a range of approaches, the guitar and keys, at first intricate, become heavier and more insistent, while the vocals represent a'Falling back to sanity,' the line repeated and punctuated by the sound of laughter. The C-Sides Project thankfully avoid cliché in what is after all a harrowing and much misunderstood theme. Their approach is impressionistic, both lyrically and musically, allowing the tale to gestate in the imagination, moving along a spectrum from helpless confusion and anger to clarity and hope. It is best approached, not as a series of 10 episodes and an epilogue, but as a complete piece with multiple sections, otherwise the drop into short instrumentals half way through can be disorientating and the effect of the musicianship, especially Rosser's coruscating guitar will be lost. There is, however an unevenness about the work and overall the sense of a dramatic narrative direction is lost. While Reaching Out offers a musical reprise of the opening, and No Regrets presents a direct commentary on the failure of Blackwell Island to achieve what it was intended to do, the final track, On Reflection sounds, as the title suggests like a bit of an afterthought, presenting a comparatively low-key ending. But as for Bly, it is disappointing that having been introduced to her at the start, it appears her (albeit fictionalised) voice is lost she is not heard again. This marks a new direction for the C-Sides Project, and if the band themselves sound a little tentative about making any great claims, then a little bit of reserve doesn't go amiss. This is a strong musical performance with much to admire throughout. A difficult subject is treated with sensitivity and a remarkable story is given a welcome re-airing. This was much more enjoyable to listen to than I'd anticipated, and certainly marks a leap forward, although the sense of an opportunity missed is frustrating.